While the symptoms of knee arthritis may be tolerated with some medications and lifestyle adjustments, for many, knee replacement is the only way to reduce pain, restore function, and improve the quality of life. 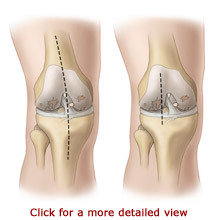 Knee Replacement Surgery, also called Knee Arthroplasty, involves removing the damaged portion of the knee and replacing it with artificial implants called prosthetics. 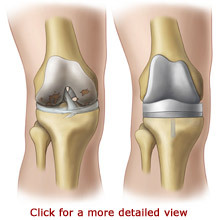 Knee Arthroplasties are the most common type of joint replacement surgery. They are highly successful for relieving pain and restoring joint function. The knee is one of the most complex joints in our body. Our knee is composed of three bones. The femur, our thighbone, is positioned on top of the tibia, our larger leg bone. The patella, our kneecap, glides in a groove on the end of the femur. Ligaments connect our knee bones together. Ligaments are strong tissues that provide structure and allow motion. Large muscle groups in our thigh give the knee strength and stability. Your doctor will order X-rays to see the condition of your bones and to identify areas of arthritis. Your doctor may order Magnetic Resonance Imaging (MRI) scans or a bone scan. A MRI is used to obtain more detailed images of the ligaments and cartilage. A bone scan identifies the location of abnormal growths in a bone. A bone scan requires that you receive a small harmless injection of a radioactive substance several hours before your test. The substance collects in your bones in areas where the bone is breaking down or repairing itself. X-ray, MRI, and bone scans are painless. As your arthritis progresses and becomes more severe, medications, rest, and physical therapy may fail to relieve your symptoms. Your pain and immobility may cause you to limit your activities and lifestyle. 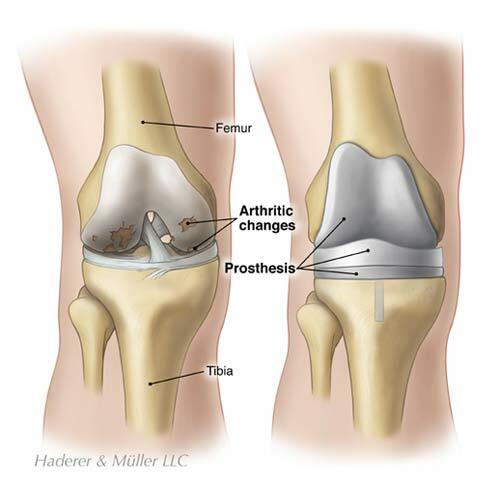 Knee Arthroplasty or knee replacement is recommended when non-surgical treatments do not provide relief of your symptoms. Physical therapy will begin immediately after your surgery. Your physical therapists will show you exercises to do in bed to help strengthen your knee and increase its flexibility. Your physical therapist will help you stand and walk. Walking and knee movements are very important to your recovery. At first, you will need to use a walker or crutches while standing and walking. As you recover, you will learn ways to exercise to strengthen your knee and improve your endurance. This may include using exercise equipment, such as a treadmill or a stationary bike. Your physical therapist will provide you with a home exercise program. When your incisions are healed you may perform physical therapy exercises in a heated therapeutic pool. The heat may help to relieve pain and stiffness, while the water provides you with support while exercising your joints. It is important to keep the muscles around your knee joint strong. An occupational therapist can show you ways to dress and bathe within the realm of your initial movement restrictions. Your therapists can recommend durable medical equipment for your home, such as a raised toilet seat or a shower chair. The equipment may make it easier for you to take care of yourself as you heal. The success of your surgery will depend, in part, on how well you follow your home care instructions during the first few weeks following surgery. You may need a little help from another person during the first few days at home. If you do not have family members or a friend nearby, talk to your physician about possible alternative arrangements. You should be able to resume most of your regular activities in three to six weeks after your procedure. You should notice a steady improvement in your strength and endurance over the next six to twelve months. 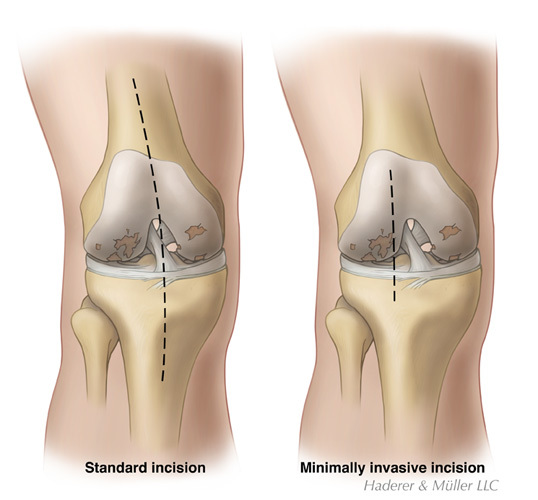 Overall, the majority of people experience a dramatic reduction of knee pain and the ability to resume functional activities after Knee Arthroplasty. It is important that you adhere to your exercise program and safety precautions when you return home. You should stay as active as possible, but remember not to overdo it. It is important to avoid falling. Your therapists can suggest ways to prevent falls in your home. This may simply mean removing throw rugs and making sure that your walking path is free of cords or clutter. You should also continue to use medical equipment as advised.